sheep and no city: Happy Easter! Yes, I know. Easter was last weekend but back then I couldn't show you my Easter eggs. Or show you anything, coming to this. Now, I am happily connected to the internet again, and here you go. 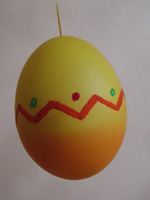 There is still no knitting group around here but a painting-easter-eggs group is kind of a start. We had a great time, splashing in colours. Of course rather of singular nature, the easter egg painting, and I have to admit that doing it once a year is really enough for me. Maybe I got someone interested in dyeing, though. But I will come back to that later. 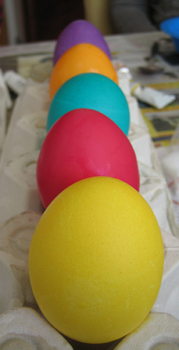 The eastereggs were first coated in whole with some special dye (that can also be used for dyeing wool I am told) and then furhter decorated, according to taste. I failed to take pictures of the pretty eggs some of the others made (cute little easter bunnies and birds or stunning graphic designs). Here's one of mine. True to Project Spectrum, because Lolly apparently has thought this project well through and figured that April, Easter and orange and yellow go really well together. Almost in time the daffodils almost show their pretty faces. 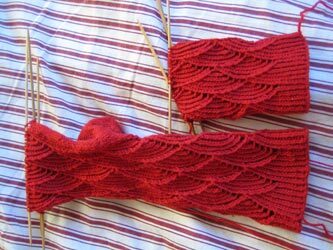 Just for the record the progress on my Pomatomi socks. The longer it takes, the more I fall in love with the twisted stitches. I was racking my little brain to come up with a pattern in this style myself, but now Hedera is out. I might as well just give this one a try first. Maybe I will be out-twisted afterwards anyway. I also knitted alon on ome tiny projects that cannot be revealed yet and casted on for a Project Spectrum project. Get this? Project Spectrum project. This reminds me about one of my favourite word constructions in Icelandic: Bílaleigubíll. For the explanation. leiga means 'to rent' and bíll is a car. So, when the idea of a taxi spread over here, it was called 'a rented car'. Later, when the idea of hired cars was introduced, someone must have come up with this strange expression Bílaleigubíll which translates car-rent-a-car or something like that. Of course, as always with language those, who use the expression by heart don't even realise its awkwardness. So it's all my pleasure to smile about it. But back to the project. It is going to be another Spherey in bright orange. See how the book matches? I am done with the body now but I'm afraid, the arms and legs will have to be green, if I designate Spherey 2 to Project Spectrum entirely. Other things, not last and foremost not least: I received my Project Spectrum postcard for March from Kim some while ago. She went for a state theme which was perfect for the colour red because their 'national' bird is the Cardinal. What a shame that I had never heard of this cute little fellow before, look here. Thank you very much, Kim! More on this in one of the next posts. by Carola at 11:41 f.h. Hehe, I haven't ever thought about "bílaleigubíll" as a strange word. Totally true that when you are used to the word you don't really think too much about its literal meaning. But there are many words like this in Icelandic, since it is a very "descriptive" language. One of my favorite lake-names is Vatnsdalsvatn, literally "lakevalley-lake". Which came first, the lake or the valley? apríl 23, 2006 3:22 e.h. The eggs are just lovely, and I'm thinking once you get those women dying one thing, you can get them dying others! apríl 23, 2006 4:12 e.h.
apríl 23, 2006 4:18 e.h. The car thing reminded me of a food we have in Philadelphia - water ice. If you mention it to non-Philadelphians they get confused - isn't all ice made from water? But ours is specifically this fruit flavored soft mushy ice. Kind of like a snow cone, but not. apríl 23, 2006 6:18 e.h.
My cousin and I just had the discussion about daffodils being called Easter Lillies, in Icelandic. 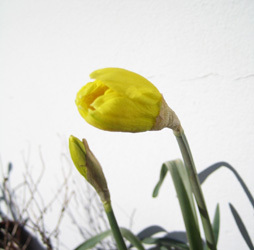 When I got home from Iceland mine had just bloomed. apríl 23, 2006 8:29 e.h. I'm fond of twisted stitches too. The Pomotomi are very neat looking with all those wavy lines. apríl 23, 2006 11:14 e.h. Such a lovely spring post! 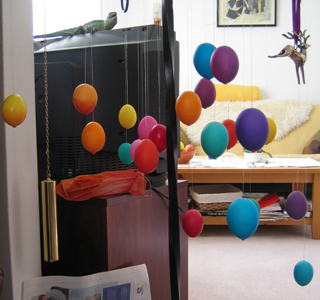 Looks like it is warming up in Iceland :) The Easter egg picutres are beautiful, Carola! I hope you had a nice holiday! apríl 24, 2006 11:06 f.h. Ha ha. That's funny. Actually it would be more car-rental-car, either way it's funny. I love to read your blog. 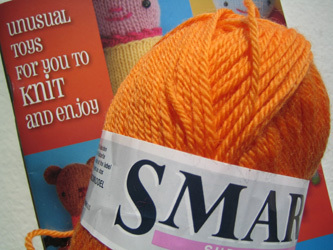 Since you live in Iceland perhaps you would be interested in the Icelandic on-line knitting group Garnaflækja (http://groups.yahoo.com/group/garnaflaekja). It's in Icelandic. apríl 25, 2006 4:15 f.h. Love your Pomatomi socks! These are on my list as well so its nice to see others enjoying the pattern so much. Dye-o-rama is going to be so much fun! Glad you joined! apríl 25, 2006 12:22 e.h.